Green Writers Press, 9781732743458, 150pp. This anthology features poems by Mark Doty, Ross Gay, Donald Hall, Marie Howe, Naomi Shihab Nye and many others. These poets, from all walks of life, and from all over America, prove to us the possibility of creating in our lives what Dr. Martin Luther King called the "beloved community," a place where we see each other as the neighbors we already are. 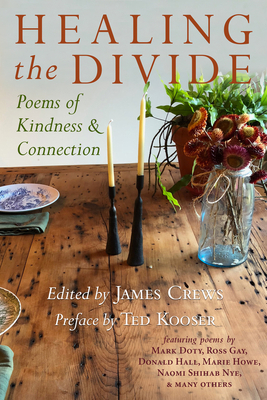 Healing the Divide urges us, at this fraught political time, to move past the negativity that often fills the airwaves, and to embrace the ordinary moments of kindness and connection that fill our days. James Crews’ work has appeared in Ploughshares, Raleigh Review, Crab Orchard Review and The New Republic, among other journals, and he is a regular contributor to The (London) Times Literary Supplement. His first collection of poetry, The Book of What Stays, won the 2010 Prairie Schooner Book Prize and received a Foreword Magazine Book of the Year Award. Other awards include residencies from the Sitka Center for the Arts and Caldera Arts as well as two Dorothy Sargent Rosenberg Prizes. He holds an MFA in creative writing / poetry from the University of Wisconsin-Madison and a PhD in writing and literature from the University of Nebraska-Lincoln, where he worked for Ted Kooser’s American Life in Poetry newspaper column and grew to love the Great Plains. He now lives on an organic farm in Shaftsbury, Vermont, just a few miles from the Robert Frost Stone House.